If you look at the title of this post and have no idea what any of those types of labels look like, do not fear for you have probably touched, seen, opened or have come across all of these labels when purchasing various items. These labels are commonly found on many different products in grocery stores on the packages for chemical cleaning products, vitamins, nutraceuticals and pharmaceuticals. Now these labels are all similar in various ways but it is good to know what makes them different and why when choosing the best product for your packaging needs. Booklet labels and extended content labels are used on products that have extensive information and facts which cannot be fit into the area of a single label on the packaging. Just as it sounds, booklet labels open like a book in a multi-panel format so that the information about the product remains easy for the consumer to read and easy for the producer to ship as many units as possible by retaining the shape of their packaging. Often times these labels will unfold like a leaflet brochure. Extended content labels are the same thing as booklet labels but tend to be removable because they provide extended information that is not usually informative and are used more for advertising and promotional purposes. Booklet Labels are attached by a self-adhesive label. ECL’s are also attached with a self-adhesive label but tend to be removed or re-sealable depending on the product it is attached to. Also ECL’s are more customizable by shape and size than booklet labels because they do not need to have the same dimensions as a self adhesive label. Traditionally you will find these labels on small bottles or large cartons and containers of different products. Instant Redeemable coupons are very similar to extended coupon labels in the way they are made. IRC’s are affixed to a package using an adhesive backed specialty liner as a promotional offer and can be removed from the stick – on label. These are most commonly found in the food and beverage industry to promote events, product deals, and other various award-based opportunities for customers. The largest benefit afforded by all of these types of labels is that they can reduce packaging costs for producers. First they are cheap and easy to make because they do not require as much material as a traditional label while providing the necessary extensive product information. Also, they eliminate the need for new product packaging because they can be easily applied to existing packaging. What Has Changed and Why : In early May of 2016, the FDA released new regulations for the Nutrition Facts labels we are so used to seeing appear on a large portion of food and beverage packages. These new regulations are designed to highlight scientific information specific to various foods enjoyed by the American consumer. In addition to detailed nutrition facts these labels will provide information on the link between obesity and heart disease. Aside from requiring calories, servings per person, and serving sizes to have bolder and larger fonts, the physical appearance of the new label maintains its “iconic” look that we are accustomed to seeing on food and beverage packages. 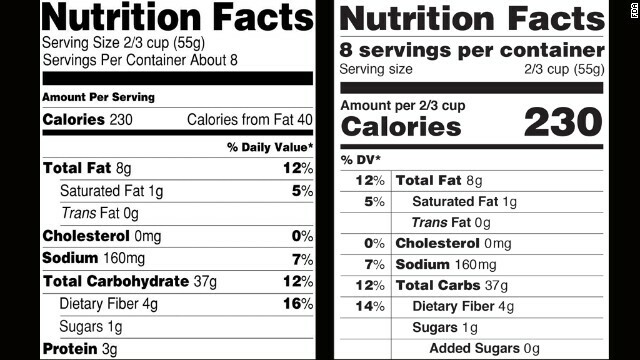 The serving size portion of the label now displays two metrics, the amount of cups from one serving and the equivalent amount of grams per serving. Actual gram amounts of vitamins, calcium, iron, and potassium must be declared on the label and manufacturers can choose to include the gram amount for any additional vitamins and minerals. At the bottom of the label the percent Daily Value definition is more explicit and easy to interpret by telling consumers how much of a certain nutrient in one serving of food contributes to the daily diet of an average consumer. Specifically the new caption will read, “The % Daily Value tells you how much a nutrient in a serving of food contributes to a daily diet. 2,000 calories a day is used for general nutrition advice.” Source FDA. Left: Current Label – Right: New Label. The biggest change to the old label is the new requirement that includes “Added Sugars” measured in grams as a percent daily value relative to a 2,000 calorie diet. This change is pivotal because scientific studies have shown that it is difficult to meet nutrient needs and stay within calorie limits when more than 10% of one’s daily calories come from added sugars which are common in most American diets. Another change that is geared to make consumers more conscious of what nutrients are present in their food is the removal of the title “Calories from Fat” because the important information that consumers need to know, in regard to calories from fat, is the different types of fat present in different foods. 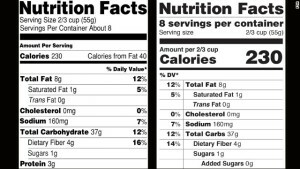 The new labels will still display the amounts of Total Fat, Saturated Fat, and Trans fat in different foods because they are required by law to appear on every label. This change in appearance requires manufacturers with more than $10 million in sales to have their labels display the new the nutrition fact requirements by July 26, 2018. Manufacturers with less than $10 million in annual sales will have one additional year to include the new information required on their labels. The purpose of these changes is to educate consumers about what they are eating when they eat certain amounts of food rather than act as a guideline for what amount of food is considered healthy to eat by using scientifically accurate information. Apogee proves to be the best resource for companies required to manufacture these new labels because of the many years that they have provided nutrition facts labels for a variety of food and beverage manufacturers. In fact, the largest portion of their business is comprised of food and beverage manufacturers in the Delaware Valley and Mid-Atlantic Region. Apogee can guide you through new or existing Nutrition Facts labeling requirements. If you need a cover-up label (opaque adhesive), a small quantity of digitally printed Nutrition Facts labels, or if you need 10 million labels then please contact us. If you need package re-design or similar help then let our graphics department ([email protected]) give you a hand.